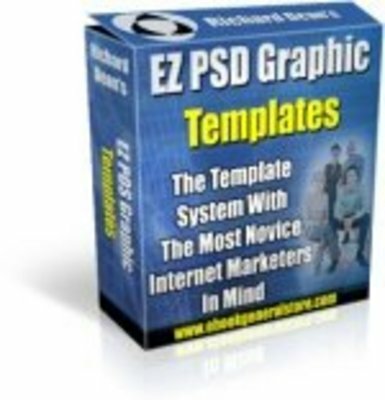 How To Save 97.00 Every Time You Need Graphics Created! ! Creating Your Own Graphics With Easy To Edit Templates! Most people are completely unaware of how easy it is to edit ready made templates, Sure graphics can be hard to do... But once you have a starting point like a ready made graphic template... well the work gets much easier and it saves you a lot of time. Save yourself 97.00 or more and edit these templates yourself in just minutes. All files are easy to edit,and or resize with any paint program that you can open .psd files with. Move the images where ever you want - Move the text where ever you want - EVERYTHING on the header is completely customizable. Now you have a Header for your site your going to need an e-cover. With all other header packages you are (SOL) trying to get a matching e-cover for your header is impossible... until now! I fill your pain, I was there at one time also I bought some headers thinking cool I edited them and then when I was ready to make my e-cover I could not do so. I was (SOL), so I want you to have an EZ solution to create the e-cover that matches your header. You need to build your cover, so Im including EZ edit flat cover templates in the bonus section below. No other header package has this and it is very necessary in creating a matching e-cover. What is a flat image? How do I build the e-cover? I get these questions all the time. The fast and easy way to build the e-cover is with some kind of software. The best you can get is an action script used with photo shop just as I used for the cover on this page. What is a flat image and what is it used for? All e-covers start out as the flat image like below. You then add your text to it and photos/images. You import that flat image into your e-cover software then the software turns it into a 3D cover. I turned the flat image into a software box above. Dont buy any header package unless it has a matching flat image so you can create your e-cover. If you do you will be SOL tring to match the e-cover with your header. Just edit the flat image file import it into your eCover software and out pops a matching cover for your use. **Ecover software Sold Separate. Simple to add your own words, backspace the pre wrote words and replace with your own words. Import the flat image into your e-cover software and out pops the e-cover. It is that simple now that you have a flat image to match your header. Flat images are included in the Bonus section you get one flat image to match each header. Check out the other bonus items backgrounds and order buttons and dont forget the image capture software program to capture any image you want. Want your own Templates for Your ECovers? Matching Flat .psd files so you can create a cover that matches your header. This is made to match the header to the tee. All you need to do is edit it like you did the header then pop it into any e-Cover software of your choice. Now that you have a great Graphics, you Can Use A Screen Capture Software. Graphics Screen Capture Software - This is the best I found and use it on all my projects. Bonus tool that I use every day so will you! You need to have a order button so you can take orders for your projects, I created some universal order buttons good for any website you might use. All in .psd files so you can easly edit them. Background Images - Want to add background color to your web site? Just edit your name or product name in the easy to edit .psd background file, save the new background image. Remember: All the graphics are in .psd files so you can easily edit your way to instant graphics like you never seen before. Special Note: - These graphics on this site was edited using one of the templates. I added the flat image Template to https://www.tradebit.com to create the box you see on the site. You would spend at least 97.00 on just one set of graphics that you cant even edit because they are locked by the artist. These are all unlocked and ready for you to edit in any paint program that can open up .psd files. Youre getting 10 sets, that is almost $1000.00 worth of graphics all for just the price of one set. This is a no brainer money saving graphics package that will have your site looking like you paid 10 times that much.